"SM-6" redirects here. For other uses, see SM6 (disambiguation). 21 in (0.53 m) max. The RIM-174 Standard Extended Range Active Missile (ERAM), or Standard Missile 6 (SM-6) is a missile in current production for the United States Navy. It was designed for extended range anti-air warfare (ER-AAW) purposes providing capability against fixed and rotary-wing aircraft, unmanned aerial vehicles, anti-ship cruise missiles in flight, both over sea and land, and terminal ballistic missile defense. It can also be used as a high speed anti-ship missile. The missile uses the airframe of the earlier SM-2ER Block IV (RIM-156A) missile, adding the active radar homing seeker from the AIM-120C AMRAAM in place of the semi-active seeker of the previous design. This will improve the capability of the Standard missile against highly agile targets, and targets beyond the effective range of the launching vessels' target illumination radars. Initial operating capability was planned for 2013 and was achieved on November 27, 2013. The SM-6 is not meant to replace the SM-2 series of missiles, but will serve alongside and provide extended range and increased firepower. It was approved for export in January 2017. The Standard ERAM is a two-stage missile with a booster stage and a second stage. It is similar in appearance to the RIM-156A Standard missile. The radar seeker is an enlarged version adapted from the AIM-120C AMRAAM seeker (13.5 in (34 cm) versus 7 in (18 cm)). The missile may be employed in a number of modes: inertial guided to target with terminal acquisition using active radar seeker, semi-active radar homing all the way, or an over the horizon shot with Cooperative Engagement Capability. The missile is also capable of terminal ballistic missile defense as a supplement to the Standard Missile 3 (RIM-161). Unlike other missiles of the Standard family, the Standard ERAM can be periodically tested and certified without removal from the vertical launching system. The SM-6 offers extended range over previous SM-2 series missiles, primarily being able to intercept very high altitude or sea-skimming anti-ship missiles, and is also capable of performing terminal phase ballistic missile defense. The SM-6 can also function as a high speed anti-ship missile. It can discriminate targets using its dual-mode seeker, with the semi-active seeker relying on a ship-based illuminator to highlight the target, and the active seeker having the missile itself send out an electromagnetic signal; the active seeker has the ability to detect a land-based cruise missile amid ground features, even from behind a mountain. The multi-mission SM-6 is engineered with the aerodynamics of an SM-2, the propulsion booster stack of the SM-3, and the front end configuration of the AMRAAM. Estimates of the SM-6's range vary; its official published range is 130 nmi (150 mi; 240 km), but it could be anywhere from 200 nmi (230 mi; 370 km) to as much as 250 nmi (290 mi; 460 km). The U.S. Navy is adding the GPS guidance to the SM-6 Block IA so that it has the capability to strike surface targets if needed, but given its higher cost than other land attack weapons like the Tomahawk cruise missile it would not likely be used as a primary option. In February 2016, Secretary of Defense Ashton Carter confirmed that the SM-6 would be modified to act as an anti-ship weapon. Raytheon entered a contract in 2004 to develop the missile for the United States Navy, after the cancellation of the Standard Missile 2 extended range block IVA (RIM-156B). Development started in 2005, followed by testing in 2007. The missile was officially designated RIM-174A in February 2008. Initial low rate production was authorized in 2009. Raytheon received a $93 million contract to begin production of the RIM-174A in September 2009. The first low-rate production missile was delivered in March 2011. SM-6 was approved for full-rate production in May 2013. On November 27, 2013, the Standard ERAM achieved IOC (Initial Operating Capability) when it was fielded on board USS Kidd. During exercises from 18–20 June 2014, USS John Paul Jones fired four SM-6 missiles. One part of the exercise, designated NIFC-CA AS-02A, resulted in the then-longest surface-to-air engagement in naval history; the exact range of the intercept was not publicly released. On 14 August 2014, an SM-6 was test fired against a subsonic, low-altitude cruise missile target and successfully intercepted it over land. A key element of the test was to assess its ability to discern a slow-moving target among ground clutter. On 24 October 2014, Raytheon announced that two SM-6 missiles intercepted anti-ship and cruise missile targets during "engage on remote" scenarios. A low-altitude, short-range supersonic GQM-163A and a low-altitude, medium-range subsonic BQM-74E were shot down by SM-6s fired from a guided-missile cruiser using targeting information provided by a guided-missile destroyer. Advanced warning and cueing from other ships allows the missile's over-the-horizon capability to be more greatly utilized so a single ship is able defend a larger area. In May 2015, the SM-6 was moved from low-rate to full-rate production, significantly increasing production numbers and further reducing unit cost. On 28 July 2015, the Navy tested the modified SM-6 Dual I version to successfully intercept a ballistic missile target in the terminal phase, the last few seconds before it would impact; the Dual I upgrade adds a more powerful processor that runs more sophisticated targeting software to hit a warhead descending from the upper atmosphere at extreme speed. This adds to the fleet's missile defense capabilities by allowing it to intercept ballistic missiles that could not be hit by SM-3 missiles, which targets missiles in the midcourse phase. The Navy had used the SM-2 Block IV as a terminal missile interceptor, but the SM-6 combines missile defense with traditional cruise missile and aircraft interdiction in the same package. The SM-6 Dual I configuration is planned to enter service in 2016. In January 2016, the SM-6 demonstrated both maximum down range and a maximum cross range intercepts in over-the-horizon, engage-on-remote missions supported by CEC, shattering the previous maximum engagement record it set in June 2014. Five targets were shot down in the test, proving the missile's capability to conduct multiple target scenarios. The SM-6 also sunk the decommissioned USS Reuben James in an 18 January 2016 demonstration, displaying its anti-ship capabilities. On 30 September 2016, Raytheon announced the SM-6 had again achieved the longest surface-to-air intercept in naval history, breaking its previous long-range intercept record made in January 2016. On 14 December 2016, the Missile Defense Agency successfully launched two SM-6 Dual I missiles at a "complex, medium-range ballistic missile target," proving its explosive rather than hit-to-kill warhead was capable of defeating ballistic missile threats; this ability may enable it to counter Chinese DF-21D and DF-26 anti-ship ballistic missile threats. In August 2017, the Missile Defense Agency conducted another successful intercept test of a medium-range ballistic missile (MRBM). Two SM-6 Dual I missiles were launched from the Arleigh Burke-class destroyer USS John Paul Jones to intercept a target MRBM launched from the Pacific Missile Range Facility during the terminal phase of its flight. The test marked the third successful intercept of a ballistic missile by the SM-6. Wikimedia Commons has media related to RIM-174 Standard ERAM. ^ "Australian Defence White Paper 2009" (PDF). ^ Majumdar, Dave. "How to Sink Warships: U.S. Navy Reveals Anti-Ship SM-6 Missile". The National Interest. 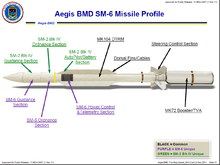 ^ "Raytheon Missile Systems Standard Missile 6" Archived 2013-05-04 at the Wayback Machine, Accessed February 10, 2011. ^ BURGESS, RICHARD. "SM-6 Block 1A Testing is Expected This Year". Seapower Magazine. Retrieved 20 January 2019. ^ Sherman, Jason. "Navy looking to increase range, speed of SM-6 with larger rocket motor". Inside Defense. Retrieved 20 January 2019. ^ Raytheon RIM-174 ERAM (SM-6), designation-systems.net, November 24, 2009. ^ "U.S. Navy Awards Raytheon $93 Million Contract for Standard Missile-6" Raytheon press release, September 9, 2009. Accessed November 8, 2009. ^ "Raytheon Delivers First Standard Missile-6 to U.S. Navy" Raytheon press release, April 25, 2011. Accessed April 27, 2011. ^ "Defense Acquisition Board approves Standard Missile-6 full-rate production". Raytheon Company. 22 May 2013. ^ "VIDEO: Navy, Missile Defense Agency Succeed During SM-6 Ballistic Missile Defense Test - USNI News". 30 August 2017. This page was last edited on 11 April 2019, at 03:45 (UTC).